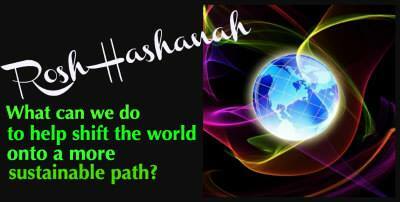 Jewcology - | Rosh Hashanah Message: Saving Our World. Rosh Hashanah commemorates God’s creation of the world. The “Ten Days of Repentance” from Rosh Hashanah to Yom Kippur is a period to evaluate our deeds and to do teshuvah (repentance) for cases where we have missed the mark. 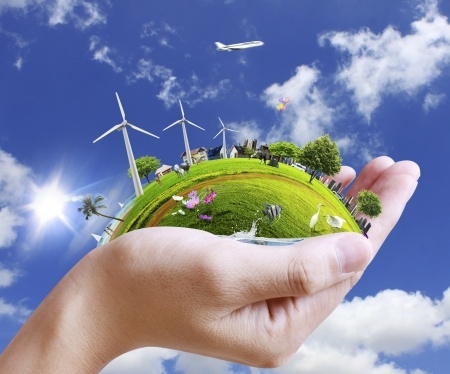 Hence, the upcoming weeks provide an excellent time to consider the state of the planet’s environment and what we might do to make sure that the world is on a sustainable path. When God created the world, He was able to say, “It is tov meod (very good).” (Genesis 1:31) Everything was in harmony as God had planned, the waters were clean, and the air was pure. But what must God think about the world today? What must God think when the rain He provided to nourish our crops is often acid rain, due to the many chemicals emitted into the air by industries and automobiles; when the abundance of species of plants and animals God created are becoming extinct at such an alarming rate in tropical rain forests and other threatened habitats; when the abundant fertile soil God provided is quickly being depleted and eroded; when the climatic conditions God designed to meet our needs are threatened by global warming? All that I have created, for you have I created them. * The Egyptians were subjected to one plague at a time, while the modern plagues threaten us simultaneously. * The Israelites in Goshen were spared most of the Biblical plagues, while every person on earth is imperiled by the modern plagues. * Instead of an ancient Pharaoh’s heart being hardened, our hearts today seem to have been hardened by the greed, materialism, and waste that are at the root of current environmental threats. * God provided the Biblical plagues to free the Israelites, while today we must apply God’s teachings in order to save ourselves and our precious but imperiled planet. Today there seems to be almost daily reports about record heat waves, severe droughts and wildfires, the melting of glaciers and polar ice caps, an increase in the number and severity of hurricanes and other storms, and other effects of climate change. All of the above and much more has occurred due to a temperature increase in the past hundred years of a little more than one degree Celsius. So, it is very frightening that climate experts project a temperature increase of 3 to 6 degrees Celsius in the next hundred years. Some leading climate experts, including James Hansen of NASA, have stated that global warming may reach a tipping point and spin out of control within a decade, with disastrous consequences, unless major changes soon occur. Israeli climate experts are concerned with additional climate threats, each and all of which would heighten tensions and suffering in and around Israel: (1) a rise in temperature causing many severe heat waves; (2) a significant increase in the Mediterranean Sea level, which would threaten the narrow coastal strip of land which contains most of Israel’s population and infrastructure; and (3) a significant decrease in rainfall, estimated at 20-30%, which would disrupt agricultural production and worsen the chronic water scarcity problem in Israel and the region. Making matters even worse, much of that rainfall would come in severe storms that would cause major flooding. * The ecological lessons related to the Shabbat, sabbatical, and jubilee cycles.